Finally Bangkok trip has came to an end. Due to it was our 1st time to Bkk, family and I joined a local tour for 5 days. The daily schedule was very hectic. We were given only a short time for each destination before we could really enjoyed it. Purple corn. Have u ever seen it before? The yellow corn taste better. This was the place where I got those 5baht (RM0.50) fresh & nice coconut drink. Mineral water provided in the hotel room in Bangkok are all in this kind of glass bottle. The Chao Phraya river that we studied before in high school. 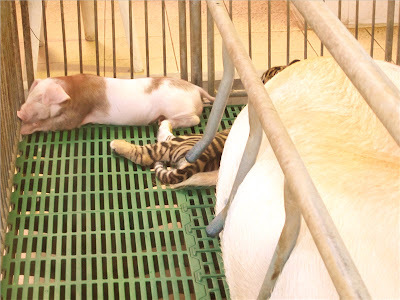 On the very first day, I went to the tiger show, crocodile show and pig show. Pigs?? Yeah, they were actually smart. they were trained to count numbers and even pig racing!! 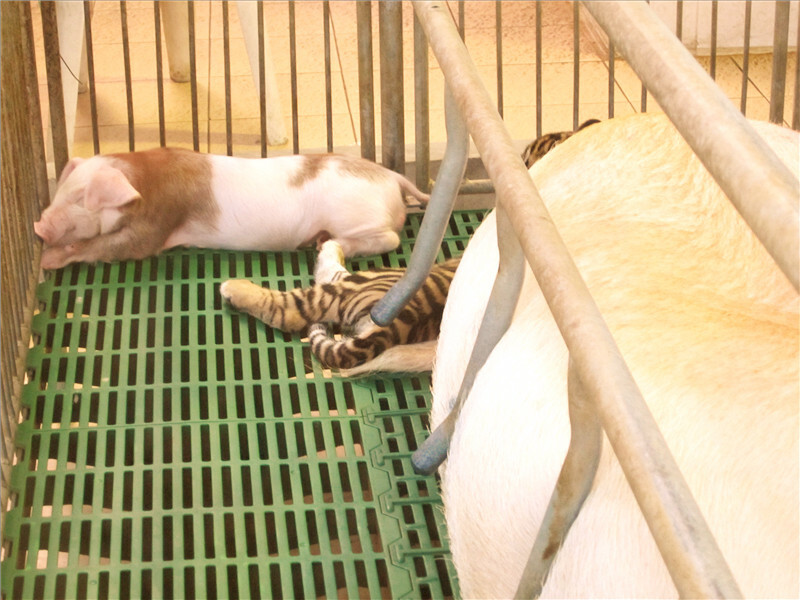 Notice the tiger stripe in between of the piglets? It is the cub that raised by a pig mother since it was born. It lives happily together with its 'siblings' from different family. After tiger show in the afternoon, I went for the Thai Girl show at night together with my family. OMG it was weird watching together with my parents @.@. Since the show was 18SX, no pictures will be attach here. Hehe. We went to Pattaya on the next day. It was a beautiful beach with turquoise water and breathtaking scenery. There, I went parachuting for my very 1st time!! The view from above was really mesmerizing. Another recommended place in Bangkok is the Safari. Unlike the zoo, in safari we are the one inside the vehicle while the animals are freed. Dear zebras, I am here. Why do you show me your back? The place I like the most ----- Ayutthaya Historical Park. I am IN LOVE WITH THIS PLACE!! So do my mum. It was destroyed by the Burmese in the 18th century. What left behind now is only its spoil building. Last but not least, how can I leave out SHOPPING in Bkk??!! No way! Platinum Mall was just a stone's throw away from the hotel I stayed. It was recommended from all the tourists. A MUST GO paradise for shopping. You can get wholesale price if you buy more than 1 piece. Those crazy shoppers were taking a luggage bag to shop. Can you imagine that? Picture taken while they were fighting for clothes. Due to financial limits and time given, here are my new shirts, dress, shoes, bag. I was satisfied with all the things I have bought. If there is a chance to Bangkok again, I think it would be my shopping trip! No more visits to tourist spots except shopping!!! yeah i cant help myself in buying shoes cz they r quite expensive here. cheap in bangkok. great post in english joey! Im proud of you!! !